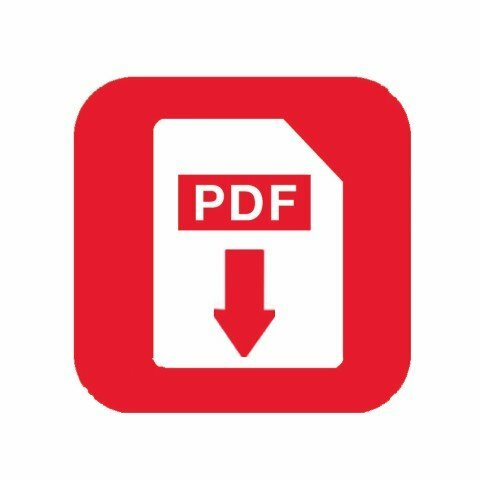 FIRST STEP: Download the order-form by clicking here Open and save for later use. STEP TWO: Complete Section A for all orders. Then, for hakama orders, use Section B to record your model choice along with Sections C and D for the wearing style and the customization information. Section E is only for dogi and obi orders. STEP THREE: Save the Order Form you've filled out and then send us a copy as an email attachment. After a careful check, we will email you an invoice, including shipping charges. STEP FOUR: Make payment using one of the methods listed in the Payment Section. STEP FIVE: We will confirm receipt of funds and then put your order into the jobstream. Depending on the item, shipping will be 15-75 days later, but priority delivery is possible if it's needed for a seminar. See bottom of the page for more delivery details. Our unique unconditional, money-back guarantee reflects an unreserved confidence in our products--for details, see the terms and conditions in the Payment Section. Contact details and payment method are more or less self-explanatory, but if you have any questions, we will respond to emails within 24 hours. For the embroidery, check the name--first or last--and whether it's to be embroidered in the standard Japanese katakana characters traditionally used for non-Japanese names. If another character set such as kanji or hiragana is required, please give full details by email or, as a default, we will embroider your name in katakana. If another name is wanted, please give details by email. If you are ordering a hakama, check silver or yellow gold but, for another color, please give details by email. 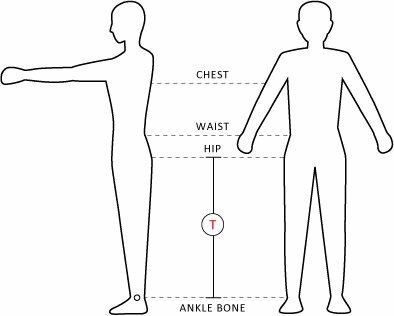 For dogi and obi colors, use Section E.
Top of Hip Bone to Center Ankle Bone (T): The measure shown in the diagram below when standing upright. Please note that you can feel the top of the hip bone: it's situated below the waist and a centimeter or two above the widest point of the hips. Chest Size: Measure taken around the chest below the armpits at widest point when standing upright in a natural posture--chest neither pulled in by exhaling nor pushed out be taking a deep breath. Waist Size: Measure taken around waist. Usually known, but it's advisable to carefully re-measure it to get an up-to-date figure. Hip Size: Measure taken around widest part of hips. Please note that if the Waist or Hip Size is greater than 100 cm or less than 70 cm, a special order may be required. Please ensure you enter all four measurements so we have a full body profile. Unless you are ordering more than one model, complete one line only and then, if you want the invisible, internally-stitched pleats, tick the box. We make the Rear Center Pleat Length (see schematic below) one cm longer than the Hip-to-Center-Ankle-Bone measure. Then, based on waist measurement and other factors, each hakama is tailored so that, when it is worn, the front and rear hems are very close to the same level, and the side vents have a vertical, V-shaped profile. This works very well for most aikidoka--even for those who tuck the front strap behind the obi for extra tightness because this has little or no undesirable effects. However aikidoka with larger waists usually tie the obi and straps at the front below the waist level under the belly for stability and comfort. So, viewed from the side, they slope downwards towards the front with the front hem automatically lower than the rear hem (closer to dojo floor). This approach will also slightly distort the side-vent profile: rear more vertical and the front curved slightly outward. And some aikidoka, in the interests of stability will also tuck in appreciable amounts of the upper front panel behind the obi--further distorting the side-vent profile. 2. If you tuck in upper front panel material behind the obi, tick the tuck-in box. Otherwise, leave unticked. 3. Ensure that you provide us with hakama measurements three and four asked for in Section D.
Also provide us with a photo of the side vent taken from the side and, if possible, another taken from the rear. Though not a feature of traditional aikido hakama, some aikidoka prefer the front hem raised a little. If you want this option (a special order), we trim the front hem progressively from nothing off at the sides to a maximum of 4 cm at the front center pleat. On the Order Form, please indicate if you want the front hem raised. And by how much (up to 4 cm). On the other hand, if you tuck in a lot of the upper front panel behind the obi, the front hem level may end up too high for you. If this is an issue for you, please tell us in an email how much you want it lowered (cm), and we will make the required structural change. 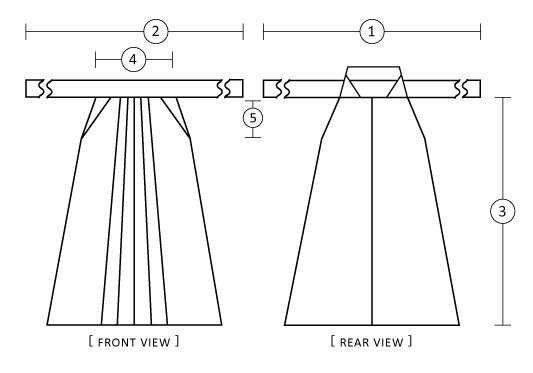 This section is used to customize the Strap Lengths as well as, for aikidoka already owning a hakama, the Rear Center Pleat Length and the Front Panel Width as shown in the schematic below. Rear Center Pleat Length (3): Measure from lower edge of strap to the hem. Front Panel Width (4): The width of the front pleated panel directly below the lower edge of the front strap--measured between the (front) tops of the side vents. Side Vent Vertical Height (5): Seen as sloping lines on the front and back schematics but, viewed from the side, these vents are V-shaped. Strap Customization; the Rear Strap Length default option is 180 cm and, for the front strap, it is four times waist measurement plus 85-100 cm, depending on the waist. These lengths usually work fine, but you can fix your own strap lengths. If you already own a hakama, experience will tell you what lengths work best for you. But, if you don't have one and want to override the default options, you can use a partner's hakama or a piece of string to get an idea of what lengths you want. Rear Center Pleat Length Customization: The front and the rear center pleat length should be the same but, if not, please make sure you give us the current rear center pleat length and the rear center pleat length you want to order. Front Panel Width Customization: If your current hakama shows significant front pleat flaring, the panel may not be wide enough for your body size. The solution is to make it wider. If you already have a hakama, please ensure you enter all four--two or none if you don't have a hakama--of the current measurements and the ones you want to order below Current and Order Measurents. Customization is not charged for and, if you have any problems deciding on exactly what adjustments you want to make to your current hakama measurements, do not hesitate to contact us by email in English, French, or German. We will respond in the same language with 24 hours. Waist and Hip Size: Where either or both are less than 70cm or greater than 100cm, we may be obliged to charge a single supplement of up to JPY2 500. Raised Front Hem: supplement of JPY2 500. Side Vent Distortion and Flaring: If your current hakama has seriously pronounced side-vent flaring issues and you feel way, way too much dogi is showing, this may be due to a short dogi but more than likely it will be related to wearing style. This can be an issue for teachers or during seminars when elegance is a more important issue. If this is the case, please complete the Order Form normally, tick the tuck-in box in Section C, and describe the problem to us in an accompanying email--possibly with photos. We will make major structural changes to seriously reduce or eliminate this kind of problem, and a supplement of up to JPY3 950 is charged. Please note that, for two or three special orders, we put a cap on the cost, and it will never total more than JPY5 000 ($45/€38/£34). The fitting table on the Dogi and Obi page is the definitive guide for you to determine the best Dogi Size for your particular physique. This means that the jacket will be ideal for the practice of Aikido--slightly loose around the shoulders and the chest but less so around the waist and hips. Once you have fixed the Dogi Size for the gi jacket, you can easily decide if it needs any customization or if a special order is required. A special order is only needed for a change in length or if special sizing is required to accomodate a large waist. It means a small extra cost and a delivery delay. For the pants, first use the selected Dogi Size to check on the Pant Width in the fitting table and, if it doesn't work for you, simply select a different Dogi Size for the pants. You can then use the table to check out the length of the pant leg--most aikidoka like the pants to end somewhere between the knee and ankle so they're not visible below the hakama hem. If necessary, you can customize the length. For embroidery or ordering an obi, see the details on the Dogi and Obi page. We carry out a careful check on all Order Forms and will get back to you if we spot any issues. Also, if you have any doubts about anything, you can contact us before sending the Order Form, and we will get back to you within 24 hours. Since each hakama is tailor-made for the buyer, we do not have "on-the-shelf" stock so orders are shipped 75-90 days after receipt of payment, except at times of major vacations. Orders for dogi and obi are usually shipped 10-15 days after receipt of funds. But if a special order is required for a dogi, it will be shipped 45-60 days after receipt of funds and, if a hakama is ordered as well, they would normally be shipped together. At any time during the order-tailoring-shipping process, you can contact us for a status report. Because of the time zone differences, email is the best way, and we will always respond within 24 hours. Unless otherwise instructed, we use the highly reliable international express postage service EMS. Delivery invariably takes 4-5 days, and you can check on progress using the tracking number we supply you when we ship. Please note that the price and shipping cost does not include any import duties, local taxes, and handling charges: these depend on your country and are paid locally to the carrier (post office) upon arrival. Details can be obtained from the local authority, but experience shows that, in most countries, customs only check 10-20% of parcels.